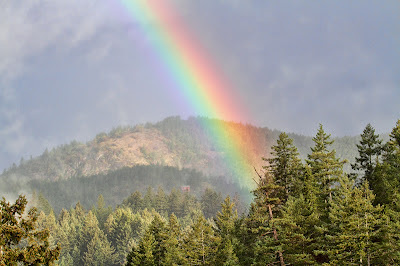 Just thought I'd share the rainbow I could see from our back deck this morning. We've had an unusually cold spring and it's been raining a lot lately too but the rainbow was a nice surprise. It got swallowed up by mist soon after appearing but the sun has broken through again this afternoon. I guess I don't mind rain so much if there's a rainbow afterwards! Wanted to thank you for purchasing one of my Funkie Bird tees for your Dad, and also thank you for the 5* review of the finished product. Your squirrels bring a smile every time I view. I have several that pass by my window every day and stop and look as I work on the computer. Someone further down the line has peanuts out for them.